Land use systems that integrate woody vegetation with livestock and/or crops and are recognised for their biodiversity and cultural importance can be termed high nature and cultural value (HNCV) agroforestry. 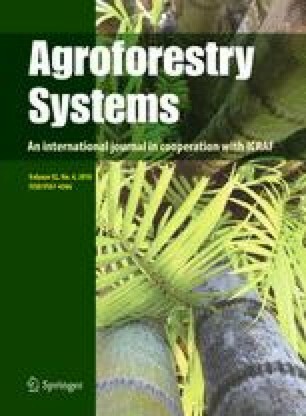 In this review, based on the literature and stakeholder knowledge, we describe the structure, components and management practices of ten contrasting HNCV agroforestry systems distributed across five European bioclimatic regions. We also compile and categorize the ecosystem services provided by these agroforestry systems, following the Common International Classification of Ecosystem Services. HNCV agroforestry in Europe generally enhances biodiversity and regulating ecosystem services relative to conventional agriculture and forestry. These systems can reduce fire risk, compared to conventional forestry, and can increase carbon sequestration, moderate the microclimate, and reduce soil erosion and nutrient leaching compared to conventional agriculture. However, some of the evidence is location specific and a better geographical coverage is needed to generalize patterns at broader scales. Although some traditional practices and products have been abandoned, many of the studied systems continue to provide multiple woody and non-woody plant products and high-quality food from livestock and game. Some of the cultural value of these systems can also be captured through tourism and local events. However there remains a continual challenge for farmers, landowners and society to fully translate the positive social and environmental impacts of HNCV agroforestry into market prices for the products and services. This paper was developed as part of the AGFORWARD project (Grant Agreement No. 613520) which is co-funded by the European Commission, Directorate General for Research & Innovation, within the 7th Framework Programme of RTD, Theme 2—Biotechnologies, Agriculture & Food.